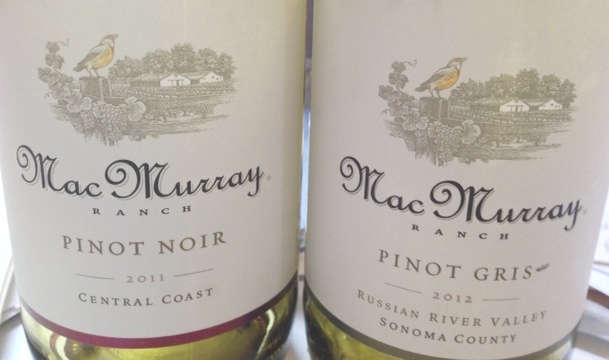 MacMurray Ranch 2012 Russian River Valley Pinot Gris ($20) will only enhance with a bit of aging. It’s good right now, though, especially with pasta parmigiana with homegrown garden tomato sauce and sauteed zuchini flowers that will soon enough be plentiful at your local farmers market. Expect flavors of pear, baked apple, dried fig and white peach in this fruit forward wine with the rich mouthfeel. MacMurray Ranch 2011 Russian River Valley Pinot Noir ($28) is a mix of lavender and mushroom from the barrels, with an elegant fruit character that includes raspberry, cherry, red currant and boysenberries. The cool climate of the Russian River Valley is why this grape works at peak performance, and the 2011 vintage proved cooler than normal. What this means? The grapes matured even slower, adding more flavor as wine. I’ll open a bottle and enjoy on my deck now that the weather permits. MacMurray Ranch 2011 Central Coast Pinot Noir ($23) is a bottle to get while there’s still some left. The 2009 Central Coast pinot noir sold out. This wine is down to earthy tones with a hint of sage. Open this bottle to aromas of raspberry and flavors of red currant and mild herbs from expert viticulture and barreling techniques. These grapes were destemmed, but not crushed, and prior to fermentation were cold soaked for a few days. Added to the winemaking technique were quality grapes from a wonderful 2011 vintage in the Santa Lucia Highlands.